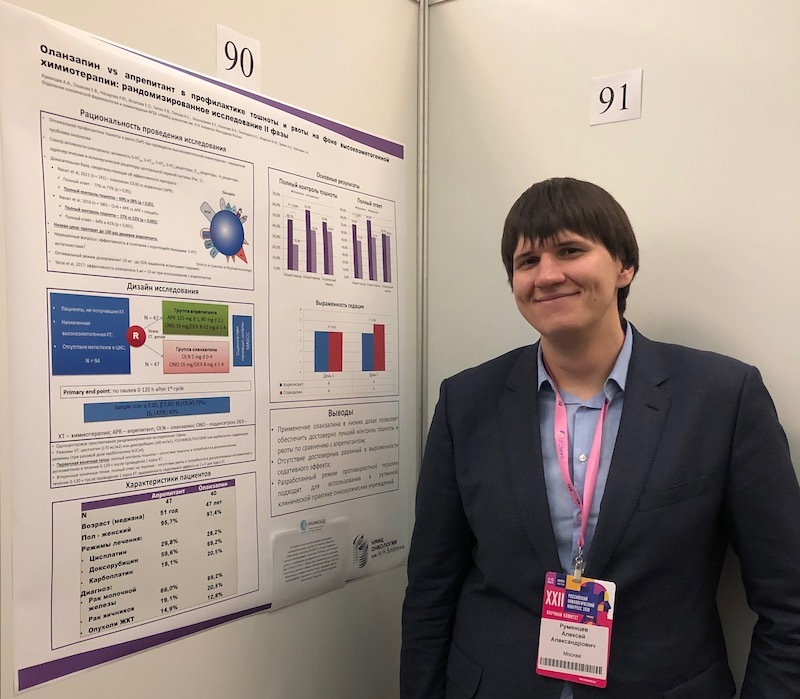 At the poster session of the XXII RUSSIAN ONCOLOGICAL CONGRESS, Alexey Rumyantsev, a graduate student at the Department of Clinical Pharmacology and Chemotherapy of the N.N. Blokhin Russian Cancer Research Center (Moscow, Russia), presented first results of a clinical study supported by a research grant from the Russian Society of Clinical Oncology (RUSSCO) and the Foundation for Cancer Research Support (RakFond) for young scientists and early career investigators in oncology. In this one-center prospective randomized Phase II study, a new regimen for the prevention of nausea and vomiting on the background of highly emetogenic chemotherapy is being studied. Preliminary results of the study suggest that the use of olanzapine in low doses allows providing significantly better control of nausea and vomiting compared to aprepitant. The developed regimen of antiemetic therapy is suitable for use in routine clinical practice of oncological institutions. Its introduction will provide access to effective and modern antiemetic therapy for thousands of cancer patients. The poster was noted among the best by the Committee of Young Oncologists RUSSCOjr. For all questions related to this study, contact Alexey Rumyantsev: alexeymma@gmail.com. For questions related to this study support by RakFond, contact info@rakfond.org.